As we move into the winter and the end of 2018, we are glad to reach out to our community members and friends to look back on what has been another remarkable year for EarthSpirit, and to acknowledge all of you who have helped to make it so. Many of you have volunteered dozens of hours teaching, organizing, staffing or planning for EarthSpirit events. Others of you have made one or more financial contributions already this year. So many people have contributed in so many ways. Thank you! We feel blessed to share membership in this committed and dedicated community. For four decades, EarthSpirit has sustained and nourished a community that supports families and individuals in truly living their spirituality, maintaining and passing along pagan cultures and traditions in a world that does not always share our values. In the US this year, we again hosted more than a dozen seasonal rituals in both eastern and western Massachusetts. 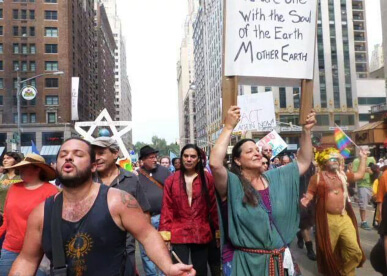 We reached out to the public at Boston Pride, at academic institutes, Pagan Pride events, environmental and political actions and at festivals and interfaith services. 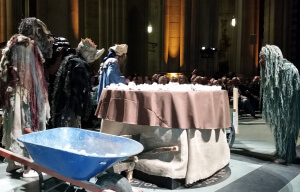 We performed handfastings, baby blessings and funerals, counseled members in need, and supported those facing medical and emotional crises. We made improvements to the ritual spaces at Glenwood, our center and sanctuary in western Massachusetts, which we open to the community as part of the Sacred Land program on a monthly basis. We continued working to develop a long-range strategic plan for the organization, and made strides toward improving our infrastructure. 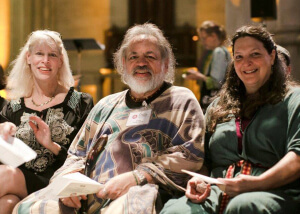 EarthSpirit has one of the longest-standing pagan events in the USA and reached a true milestone this year as we celebrated our 40th Rites of Spring and recognized and honored our first community Elders. The other big event this year was our participation at the Parliament of the World’s Religions in Toronto. Thirty-eight members of EarthSpirit attended the Parliament. Our delegation worked as an extraordinarily strong team to staff and support an information and networking booth, and EarthSpirit members offered 16 separate and important programs. 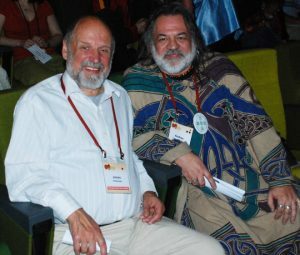 Andras Corban Arthen, EarthSpirit’s Spiritual Director, continued his very active and ongoing work on the Indigenous Task Force and on the Executive Committee of the Board, participating in planning and creating the whole of the Parliament and especially several of the plenary sessions. I was a member of the Women’s Task Force, working in advance and on site to coordinate programming involving the arts, ritual and the divine feminine, and on creating the Women’s Assembly. There is a lot to share about that week in Toronto – what we did there and why it matters. So many EarthSpirit members did so much. Kate Greenough Richardson brought our Art Salon format into the light with the “Spirit Soaring Gallery Space and Art Salon”; Arianna Knapp designed and coordinated a very professional EarthSpirit booth, where we could share who we are with thousands of people; Donovan Arthen and Will Rowan presented a workshop called “Transforming Masculinity,” featuring the work of the Brotherhood of the Stag and Wolf; 9-year-old Vivian Seier was the overall youngest speaker on the Parliament’s Plenary Stage when she came forward to represent the dignity of women in paganism. It is too much to include everything in this letter, so a complete report of EarthSpirit’s participation at the Parliament is posted on EarthSpirit Voices and on our website. The links are below. There have been some hard times this year, of course. 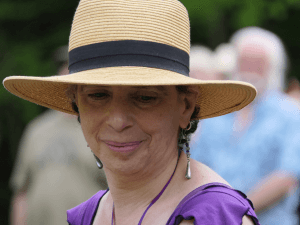 We lost Morwen Two Feathers, an EarthSpirit Community Elder and teacher, and a great friend to many of us – and we celebrated her life together. Others in the community have also passed or suffered illness or personal losses, and we have seen the community come together to hold each other. We are still facing major challenges in the US as well. 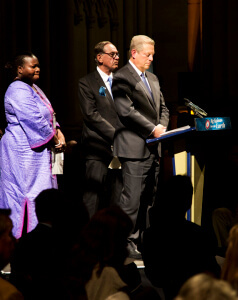 The political climate remains tense, hate crimes are still on the upswing, and we continue to see intolerance and prejudice step boldly into the light as our government moves farther away from environmental responsibility, upholding human rights and the diversity which has so enriched this country. Many EarthSpirit members feel personally vulnerable and afraid. The need for clear information and communication, mutual support, and outreach to the diverse world around us has never been more pressing. EarthSpirit is doing what it can to provide leadership and an anchor in this time of upheaval – offering encouragement to its members and taking action when we can in places where it is needed. 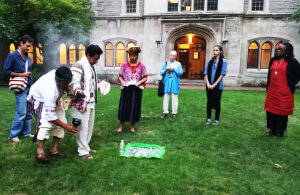 The interfaith work that EarthSpirit has been committed to for so many years offers us many valuable and reassuring connections. 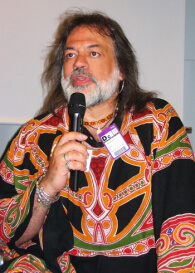 Andras was re-elected to the role of Vice-Chair of the Board for the Parliament of the World’s Religions, an international organization that is supportive of EarthSpirit and of pagans in general. 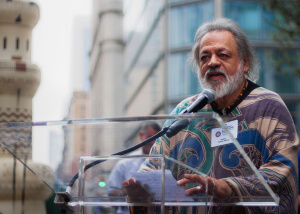 Andras also continues to serve as President of the European Congress of Ethnic Religions, and his leadership there connects us directly with people still practicing the old indigenous ways in Europe. 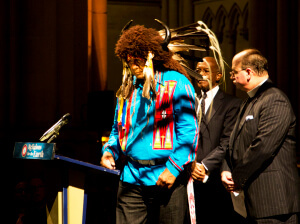 Our Earthways Initiative reaches out specifically to Indigenous leaders in the US as well as in other parts of the world. We will continue to join forces with all of these peoples and groups, to further our work to protect the Earth and support other communities who share our values. The end of the year is the time for us to wrap up our Annual Fund, so I will conclude with that. Our community has always been generous. We have consistently received contributions large and small which allow us to carry on. We appreciate every single one, as well as all of the volunteer time and expertise that our members contribute throughout the year. 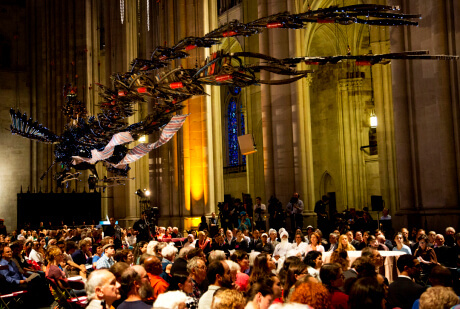 Members, like you, enable us to offer the rituals, classes and gatherings that create meeting places where we can build and deepen meaningful face-to-face connections. Your contributions help us maintain the sacred land of EarthSpirit’s home at Glenwood, make it possible for us to network with spiritual people around the world and also provide some financial support to community members who are ill or struggling. We are grateful. If you have not had the opportunity to participate in this year’s fundraising yet, or you have found further inspiration in this letter to participate once again, now is a great time. We count on all of you to be a part of the web that holds us together on so many levels. We hope to see you at A Feast of Lights this February 8-10 in Sturbridge MA! 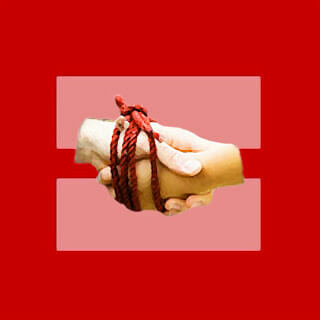 Thank you all for being part of and supporting the EarthSpirit Community. You can find out more about EarthSpirit’s work through articles in “EarthSpirit Voices” , by liking “The EarthSpirit Community” on Facebook, or by visiting our website: www.earthspirit.com. 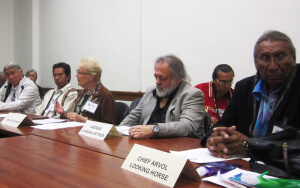 Panel on Indigenous Traditions, (l-r): François Paulette, Mindahi Bastida-Muñoz, Tonya Frichner, Andras Corban-Arthen, Chief Arvol Looking Horse. supremacy over all other beings of the Earth: the human arrogance and greed, and the objectification and devaluing of Nature that are such predictable corollaries of that notion, lie at the very core of the environmental disasters we are now facing. Christopher: Could you give us a bit of background on yourself as a person? As for what I do, I serve as spiritual director of the EarthSpirit Community, through which I’ve been full-time pagan ‘clergy’ since about 1980. My main work involves teaching, public speaking, community development, spiritual counseling, organizing events, officiating at ceremonies such as weddings and other rites of passage, and interacting with the media. The survivals I have found have certain key elements in common that I think have helped them to endure: They exist in fairly remote or ‘undesirable’ rural locations, in places where the original, ancestral languages are still spoken; this has provided them with a certain degree of insulation. They are in regions where there have been major sociopolitical upheavals which have destabilized the existing power structure and have taken the focus away from religious persecution or suppression. In 1979, the year before Deirdre came, I had organized the first Rites of Spring gathering under the sponsorship of the Mass. Pagan Federation, a networking organization of which I had been one of the founding members. 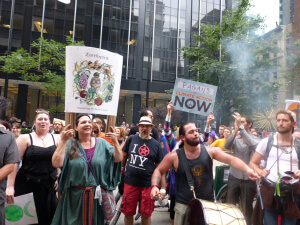 Unfortunately, as has happened with so many other pagan confederations over the years, the MPF disbanded right after the gathering, so Deirdre and I decided to continue organizing the event (which is now approaching its 34th year) [ed. note: ROS 36 will take place next month] under the aegis of EarthSpirit. Andras: The EarthSpirit website can be found at http://www.earthspirit.com, and the e-mail address is earthspirit@earthspirit.com; there’s also a Facebook page. The postal address is P. O. Box 723,Williamsburg, MA 01096. I can be reached at aarthen9@gmail.com, and I’m also on Facebook. [This interview with Andras Corban-Arthen is re-printed in full, with permission, from ACTION, the newsletter of the Alternate Religions Educational Network, Yule 2011]. 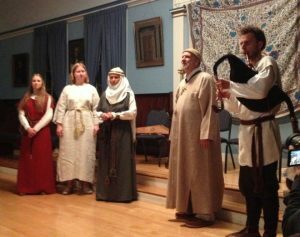 EarthSpirit recently sponsored a series of performances in Massachusetts and Vermont by Kulgrinda – the ritual performance group of Romuva, which is the name given in modern times to the revived ethnic pagan religion of Lithuania. Jonas Trinkūnas, the krivis (supreme priest) and founder of Romuva – who took part in those performances – is an old friend, someone I’ve known and respected very highly for some twenty years. Jonas attended Rites of Spring back in the nineties, and I have visited him, his family, and his community in Lithuania. In 2008, when the Parliament of the World’s Religions put me in charge of finding representatives of the indigenous spiritual traditions of Europe to attend the upcoming Parliament in Melbourne, Jonas’ name was the first on my list. Jonas Trinkūnas and Inija Trinkūnienė with Lithuanian President Dalia Grybauskaitė and members of the Romuva community at the award ceremony in Vilnius. The hard-packed snow crunches underfoot. More than thirty of us, we wend our way in single file on the narrow trail along the frozen pond. All around, the woods are whisper-still, silent watchers of this curious band of darkling figures inching forward on short, halting steps.